A few days ago Amanda posted these words from a U2 song, and they struck such a strong chord with me. Because I remember being stuck in a moment and I remember that song speaking to me through that time. Maybe you are stuck too? Maybe you are trying to figure out a routine that works for you, or a career that works for you? Maybe it is a need to make a decision about your future, or to let go of your past? Maybe it is finally accepting that you are loveable, and are loved? Whatever the reason, being stuck, is keeping you from moving on. 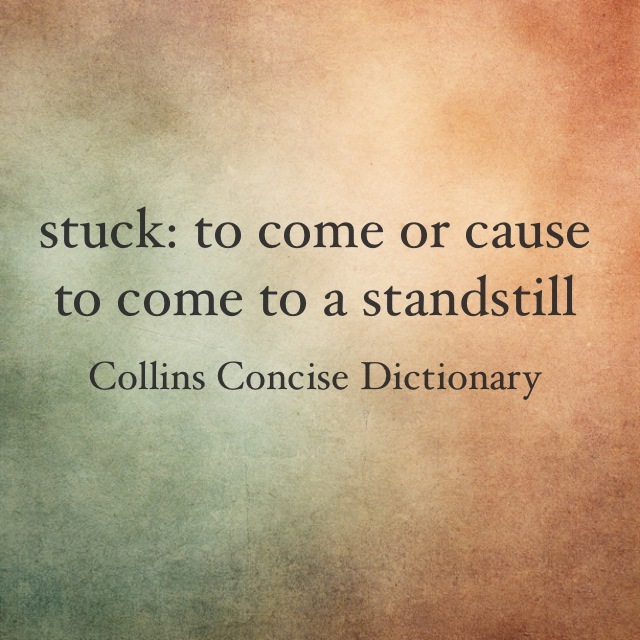 I love the definition of stuck above. When you are stuck you are not moving. You are at a standstill, there is nothing happening. Innovation on the other hand needs movement; it needs newness and energy. I believe that sometimes innovation means that you have to deal with where you have been stuck first. So here are some thoughts on being stuck and how to get unstuck. Firstly you need to recognise that you are stuck and why. My stuck moment was a period of grief and despair after miscarriage. Which I have talked about here. I knew why I was stuck and actually, it was appropriate for a period of time. But then it became a habit of being, of talking, of relating, that was a stuck way. And at first I didn’t see it as that. I thought I was entitled to my grief and my pain, but (and this is an important but) my stuckness was now at a point where I was impacting others. It took some lovingly gentle conversations with my husband and closest friends to realise that I needed to move on. And this is where my next point comes in. Recognising that you’re stuck is just the first step, then you need to seek help. Even just to recognise I was stuck I needed help, but when I finally accepted that as my reality I gathered my clan around me and asked them to pray. I made appointments with a professional to help me work through my unresolved grief and anger. And along with that I had to learn to accept help when it was offered. I learnt to say “yes please” when someone offered to cook me dinner, or take the kids for a while. I learnt that it wasn’t weakness to say “I need help”, in fact it took me a lot of courage. Where do you need to ask for and accept help? Do you need to gather your clan or just an accountability partner? Do you need to make an appointment with a professional? Or do you simply need to humbly acknowledge, “yes I need help” and accept the gracious aide from family and friends? Oh this is the hard bit. In some ways it is easy to be stuck. For me it was very easy to stay in a place of raw emotions and grief, but what I didn’t realise was the impact it was having on everyone else. But becoming unstuck takes work, and it takes time. For me it took almost a year of appointments, and I left pretty much every session with a headache from working through stuff. It was an effort. It was hard work. But the work was worth it, because going through all that stuff enabled me to let go and be free. It enables me to right now sit at a computer and type this out to you, without reliving the emotions, because I am free of that now. So the question to you is, are you prepared to do the work to be unstuck? Are you prepared to put in the time? Because it will take both of those things to get unstuck. Dealing with my stuckness has also given me more capacity to grow in my creativity and my calling. In fact my word for the year this year is capacity. Yet I sometimes find that I have patterns of behaviour and language that don’t fit now. I have to remember, “that was old Jodie, I don’t react like that anymore, I’ve moved on”. So wherever you are stuck, I hope that you can identify what is keeping you stuck, seek the help you need to become unstuck, and walk in the new found found freedom with increased capacity for innovation.